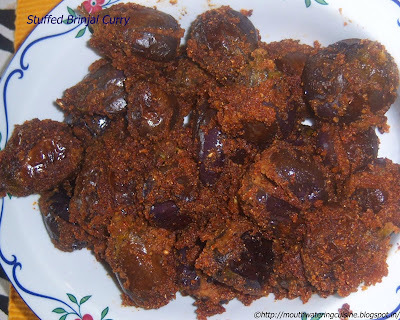 Vamkaya is also known as Brinjal or aubergine. It is the king of all vegetables. We can make so many varieties with it. This recipe is one among them. It is a must in most of the occasions in Andhra Pradesh. We need to prepare on special curry powder for this. That powder can be used in any other curry also. Wash the brinjal thoroughly. Cut the stalk of it. Slit them into four parts from the back of it. Do not cut them completely. Add salt and 1 tsp oil to the curry powder and mix well. Stuff it into the eggplant/brinjals. Heat oil in pan. Put one after the other stuffed brinjals. Sprinkle 1/4 tsp salt and 1/2 tbsp water on them. Cover them with a closed lid. The lid should be very close and tight. So that the brinjals cook fast and would not burn. Cook them over low flame. Once the brinjals become soft remove from heat.